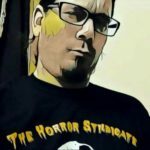 Writing for The Horror Syndicate now for over two years, I have written a multitude of movie reviews. Mainstream films or independent ones, it matters not. Because sometimes boils and ghouls, believe it or not, indie films can better than the mainstream ones. I know shocking right? Independent film releasing company Scream Team Releasing founded by Justin M. Seaman is unleashing indie films to the masses at will. After the hugely successful The Barn (2016), the company flew into full gear. Then releasing others like Rocky Gray’s 10/31 (2017), The Sleeper (2012), The Witching Season (2015) and soon to be gracing collectors’ blu-ray shelves later this month, Mike Lombardo’s I’m Dreaming of a White Doomsday (2017). So let’s take a brief look at Scream Team’s most recent endeavor. A group of friends since childhood, sleep in late, run a video store and smoke weed. That’s it. That’s their daily routine. Also, avid zombie horror fans, these guys are in for a time they will never forget. Because as it happens, the zombie apocalypse has just lumbered up to their front door. Are they going to make it through the night? Or are they just really stoned? BOLD is the first full length feature film from director Max Groah. Together with co-writer Tim Mayo, the duo created a fun group banter between the main characters. I could not help but be reminiscent of Kevin Smiths’ Clerks (1994). With Daniel Alan Kiely’s (Axe Giant: The Wrath of Paul Bunyan) performance as Hal really shining amongst the group. The title of the film alone kind of gives you an idea of what you are in for. Stoner humor is usually wasted (pun not intended) on me, but this was actually pretty effective. For the first 60 minutes it felt like Shaun of the Dead meets Clerks. The main characters even at one point, got into a lengthy debate about zombie styles in different movies, actually referencing Lucio Fulci, which was pretty AWESOME! But once the third act began the movie took a dark turn. Almost to the point where it felt like a completely different movie, once the characters sobered up and realized the severity of the situation they were in. Which really is my only gripe with Bong of the Living Dead. If it had stayed fun and light-hearted all the way through, I think it would have been a ton more effective to me. But, the stark differences in tone really changed the feel of the entire movie. But do not get me wrong. There is a lot enjoy here. It was still a very well-done independent film and I cannot wait to see what Max Groah and crew have up their bloody sleeves in the future. I leave the rest up to your viewing discretion. Looks like Scream Team releasing hit another home run! Thanks for reading boils and ghouls! STAY SCARED!